Win 5 Days, 4 Nights in Cancun! Want to return to Cancun or the Riviera Maya? Want to see it for the first time? Well, here is your chance! Enter our photo contest and Win 5 days and 4 nights! 1) Pick your best sunset photo for one of two categories, Beautiful Cancun Sunsets or Beautiful Sunsets. *Beautiful Cancun Sunsets can include photos from Cancun, the Rivera Maya and Isla Mujeres. *Beautiful Sunsets photos can be sunset photos from around the globe. This gives those of who that have not previously visited Cancun or the Riviera Maya the chance to win. * In the subject of the e-mail, write the category to which you are submitting your photo (i.e. Beautiful Cancun Sunset or Beautiful Sunset). * In the body of the photo, write your name, full address and photo description. 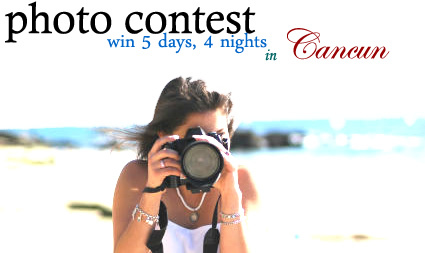 1) 3 photos from each category will be selected from our Cancun Great Vacation judges. 2) The winning photos will be uploaded to Our Facebook Fan Page. 3) Fan voting begins. That means, Cancun Great Vacation fans vote for their favorite photo from either or both categories. 4) The photo with the most ‘like’ s from each category wins. This means, two winners, 4 people go on vacation. Submission implies the author is granting photo publication and copyrights to Cancun Great Vacations. The contest is limited to ONE photo per person and per category. Photo specifications: 600 x 400 pixels minimum. So it can be published without loosing quality. *The chance to upgrade your prize to all inclusive or to our luxury Hacienda Tres Rios resort at a discounted rate.